This exciting excursion will be heading to North Norway, Kirkenes. The trip is done by modern and comfortable coach and the guide will tell you about Lapland, Lake Inari, Sami culture, reindeer herding etc. Breakfast will be served in Sanila reindeer farm by the way to Kirkenes. Thermal gear will be changed in Kirkenes Snow hotel. A totally unforgettable experience awaits you on the frozen fjords of Kirkenes! After changing thermal gear (overalls, socks, boots and balaclava headwear), approx. 35 min sleigh ride pulled by snowmobile will start. This is your chance to catch, learn how to cook and most importantly EAT this mysterious creature. The Arctic King crab is one of the most popular starter dish in top restaurants and now you have opportunity to taste it as its freshest, pulled from the fjord in front of your eyes. You can even help in sawing the hole in the ice and bring up the catch. Checking the crayfish traps will take approx. 40 min. 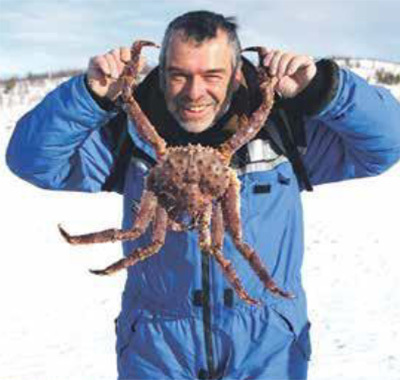 Snowmobile sleigh ride will take us to a beautiful farmhouse by the lake and our master guide will prepare the caught crab for you to taste. Thermal gear will be returned and bus trip back to Saariselkä will start. We will stop in reindeer farm for meal by the return way. And if the weather is good in the evening, we can make a stop of few minutes for watching Aurora Borealis on the route Kirkenes - Saariselkä - Kakslauttanen. Producer: Kukkolan Tilausliikenne Oy, y-14658081.